It’s hard to find good coffee in Brisbane. In search of the perfect cup (the one that arrests your senses while smoothing your forehead), I have drunk my way through mediocrity and back several times over. Just a few days ago I stopped by a promising venue with a steady stream of customers. I shall name no names, but this store was located in the trendy New Farm area, featured a wide range of coffee paraphernalia, and displayed several awards for its coffee. Maybe I was just unlucky to strike a hungover or hormonal barista, but my coffee displayed the all-too-familiar weak, milky, one-dimensional flavour that blights the otherwise thriving Brisbane cafe scene. Another half-drunk coffee for the bin. The major sin is a distinct lack of strength and flavour, although a too-low temperature is also common. Soon after arriving here, I took to ordering cappuccino rather than my normal flat white, reasoning that a lower milk-to-coffee ratio would taste stronger. This did result in a small improvement, but a further issue is the use of over-large cups. It wasn’t until I began to order double shots, and sometimes to request two-thirds the usual amount of milk, that the coffees I ordered occasionally achieved that all important kick. Unfortunately, grunt alone does not make for an optimal coffee experience. Fortunately, I am possessed of a greedy disposition that interrupts my tendency to neuroticism. 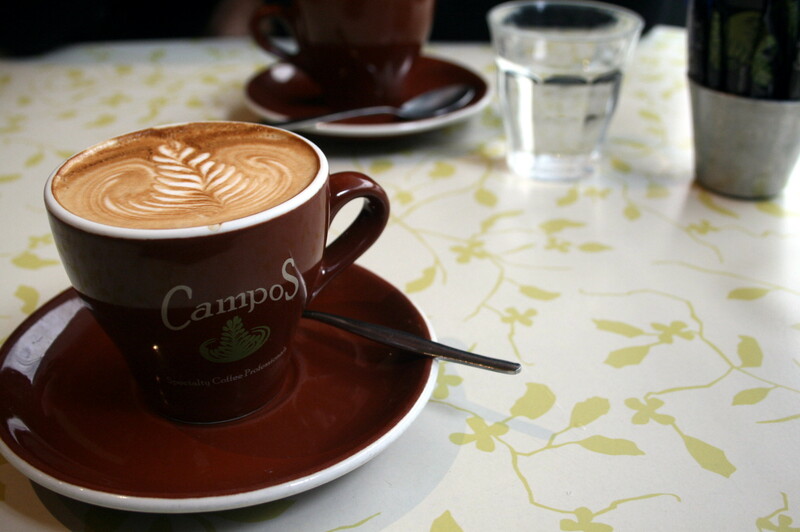 Tasty coffee is good enough for me; hell yes Campos, I’ll be back. Dammit, I forgot to ask you what you mean by this (the you and Fre part), cryptic Amy!